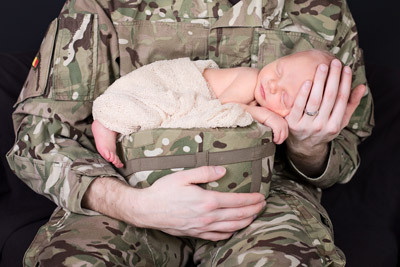 A TOUCHING calendar has been launched by military charity, My Daddy is a Soldier Adventures, showing special moments between soldiers and their children that will make your heart melt. The calendar includes 14 beautiful pictures showing what “My Soldier and Me” means to families of the British Army. Hundreds of families sent in photos, as part of a competition, hoping to be featured in the calendar. The winning image, featuring in April, is of seven-year-old Declan Jones and his dad Sergeant Mike Jones, who serves with REME, Army Recruiting Team in the West Midlands. The image (pictured above) shows the love Declan has for his dad and that the pride of being part of the British Army is family-wide. Second place went to Reilly James Crowston, just 21 months, from Tidworth (pictured right). The family was delighted to be selected and thrilled that their boy will feature in June. Louise Fetigan, founder of My Daddy is a Soldier Adventures, said: “Growing up in an Army family can be so hard, but also so rewarding. My Daddy is a Soldier Adventures supports the children (Little Troopers) of British soldiers. It aims to build a community where the children and parent at home can support each other, share their experiences and coping mechanisms for long tours. The calendar costs £9.99. Visit www.mydaddyisasoldieradventures.org to get your copy.